If your home is already wired with RJ-45 cable, it will be relatively easy to set up your home network. However, if your home does not currently have RJ-45 cable in the walls, you will need to install it in the rooms where you plan to place your computers, printers and routers. Before installing any cables, take care to plan where your router will be placed first, and then plan where all other network devices will be placed. Also, for your safety and the protection of your home, you may want to consult with or hire a professional to install your RJ-45 cable. 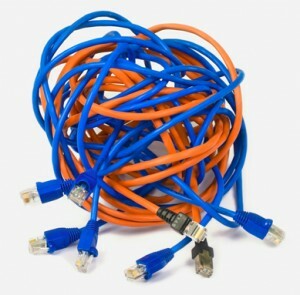 What is an RJ-45 cable? I have a router, NIC Cards and RJ-45 cables. How do I set up my wired home network?